We are just cruising right along through the first week of October. Seriously, how do the days go by so quickly? Ugh. So what are your thoughts about Halloween? Personally, I find the entire month of October rather terrifying. I’m a big scaredy-cat when it comes to all things associated with ghosts, zombies, clowns, etc. In fact, I can’t even stand to watch the previews for Halloween movies, let alone sit through an entire 2 hour horror film. The hairs on the back of my neck are standing up just thinking about it. Eeeek! Probably the only thing I like about Halloween is all the candy. Just being honest. Anyways, let’s talk about something less scary. Like kale. And mushrooms. And quinoa. And all sorts of other yummy vegetarian things. So, I was looking at the recipes that I’ve been making lately and a common theme emerged: everything seemed rather orange. From squash to sweet potatoes to carrots. It was all similarly hued. Orange is actually one of my favorite colors. But it still all seemed a bit too much. So I got motivated to make something green (or at least partially green). And hence, the recipe for these Kale and Quinoa Salad Stuffed Portobello Mushrooms with Apples and Pecans was born. Stuffed mushrooms seem like they would generally be a healthy choice. But often times they are not. That’s because they tend to get loaded up with cheese, breadcrumbs and butter. Which are all delicious things, of course. But not always the best for you or your waistline. So I try to keep my stuffed mushrooms on the lighter side by filling them with seasonal salads. 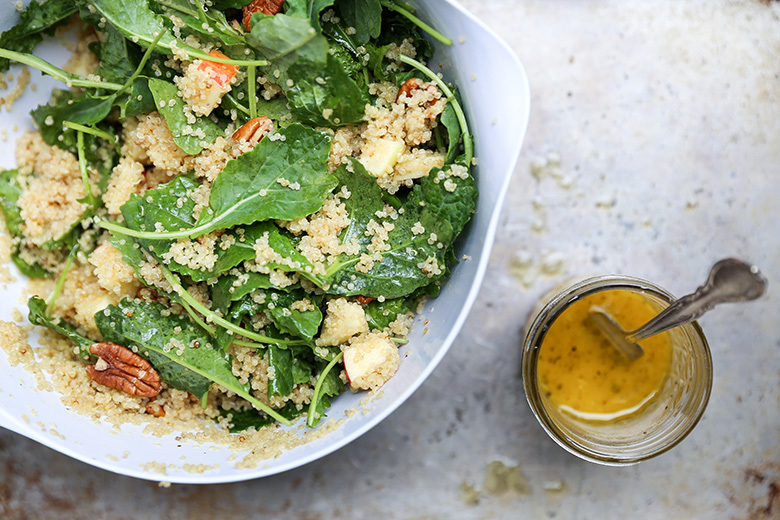 This salad of apples, pecan, baby kale and quinoa is pretty gosh darn good all on it’s own. And you could certainly serve it as is. But I think it’s even better when paired with these roasted mushrooms. The contrast of flavors and textures is spot on. I like to buy baby kale leaves, because they are really tender. But if you can’t find them, just thinly slice some regular (grown up?) kale leaves into thin ribbons. Easy peasy. Oh and I almost forgot that it’s 30 Minute Thursday! Scroll down below the recipe to find links to some other great dishes that can all be made in 30 minutes or less. There ain’t nothing scary about that! Bring the water to a boil in a saucepan over medium heat. Stir in the quinoa and turn down the heat to maintain a simmer. Cover and cook the quinoa until all the water has been absorbed, about 15 minutes. Remove the saucepan from the heat. Fluff the quinoa with a fork and then cover the saucepan and let the quinoa steam for 5 minutes. Meanwhile, pre-heat your oven to 425 degrees. Line a large rimmed baking sheet with aluminum foil and then place a baking rack over top. Remove and discard the stems from the Portobello mushrooms. Using a spoon, scrape out and discard the gills. Wipe the mushrooms clean with a damp paper towel. Then brush both sides with the extra-virgin olive oil. Place the mushrooms on the baking rack gill side down. Then season the tops with a pinch of salt and black pepper. Transfer to your pre-heated oven and bake for about 18-20 minutes. The mushrooms should be soft, but still firm enough to hold their shape. Remove from the oven and set aside. Add the cooked quinoa, kale, chopped apple and pecans to a large bowl. Pour the dressing over top and toss gently until everything is well coated. Flip the mushrooms over so the gill side is facing up. Then fill each mushroom with some of the salad mixture. Serve immediately. I’m not over-the-top with Halloween, but I do like it. And I’m terrified of haunted houses and scary movies, but I still put myself through those haha. Well, the scary movies at least! I would love to cozy up with a big bowl of this salad. Looks SO good, Liz! I especially love those stuffed mushrooms. So creative! Thanks, Gayle! I’m definitely too chicken to go to a haunted house! Lol. October is one of my favorite months of fall because I’m a big Halloween fan! Even though my boys are way older now, I still loving giving out candy and seeing all the kids dressed in costume! 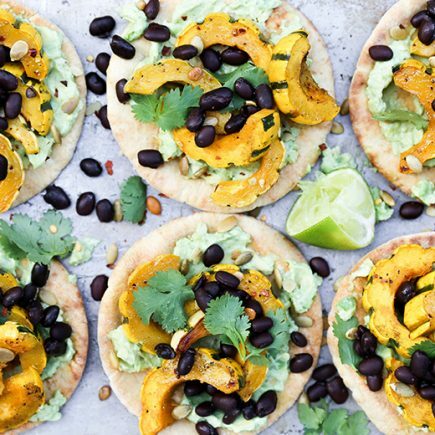 Great recipe to keep us on the healthy track Liz! These sound delicious. I love the addition of the quinoa and the apples. The dressing sounds wonderful too! Thanks, Mary Ann! I think I might get a lot of trick-or-treaters this year, so that could be fun! Yes, I should totally give out Portobello mushrooms to the trick-or-treaters. I’m sure they’ll love that. Lol! Oh my gosh, I love all things scary! Even as a kid, I loved watching zombie movies and horror movies. They actually had to get me off the scary movies when I went a little overboard with it. It isn’t just about Halloween for me. I get my scare on year-round. I agree with you on stuffed mushrooms. So tasty, but so unhealthy. I love this healthier salad version. Halloween and Christmas are my husband’s favorite. He is one of those that totally gets into the spirit whereas I just stand by and let him do his thing lol. Eeks, I can’t watch a horror film either so I’ll just take a big plate of this gorgeous salad instead! Love the stuffed mushrooms and apple maple dressing sounds amazing! I can’t do scary things either! ESPECIALLY scary movies—just watching the previews in a movie theater freak me out too! 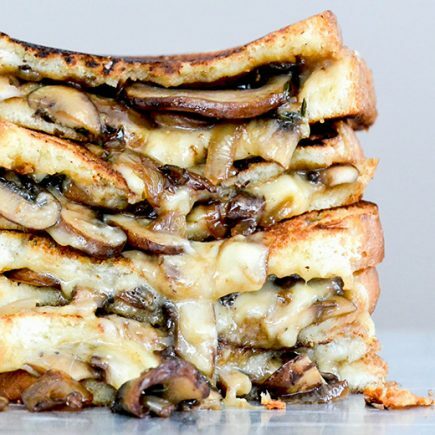 But these mushrooms…oh my GOSH you just stuffed them with basically all the best things! 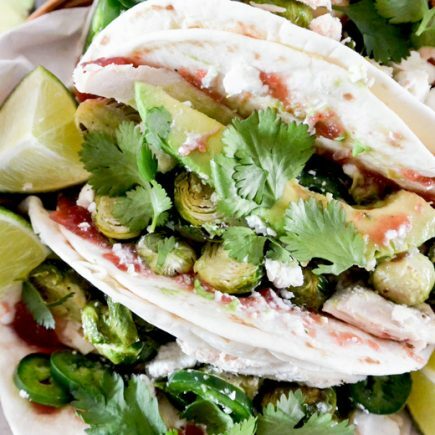 Totally drooling over and craving an entire personal-sized pan of these! Ok we’ll skip the movies and eat stuffed mushrooms together instead! Yeah no kidding, how is it OCTOBER?! And we got snow today which I don’t want to talk about. I love the looks of these mushrooms! I made my first batch of portobellos in the summer and am hooked. Must try these! SNOW! Gah. I can’t even deal with that yet. Things are happening way too quickly! I don’t really like Halloween either, except the candy of course!! These stuffed mushrooms sound like the perfect meal! I was just thinking the same thing about the recipes I share this time of year! When I look at my Instagram profile, it seems like everything is kind of orange-ish and I’m determined to add some color! 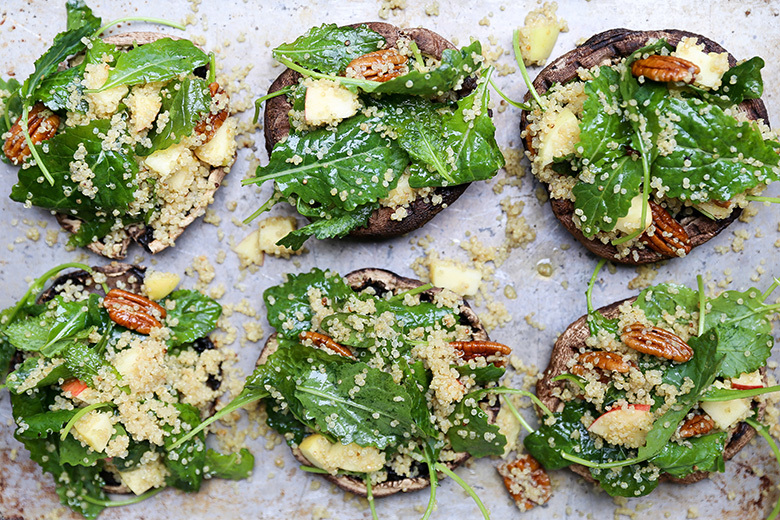 These stuffed portobellos have so many of my favorites- kale, quinoa, apples, pecans… YUM! My favorite on Halloween is the candy too. If I’m being honest I hate having to buy costumes for the kids and they only use them once. Once! $100 bucks down the drain for a one time use. Ugh! But gotta have the kids be kids. 🙂 I love this recipe! Perfect after a night of trick or treating and eating junk by the gallons. This is one recipe/dinner to center you and bring you back to normal. Yum! I made these last night for dinner, didn’t have any kale so I picked some Malabar spinach off my vines and used a tri-colored quinoa. I paired it with roasted beets, turnips, carrots & parsnips. It was delicious and the hubs loved it too! That’s great to hear, Audrey! And love the addition of all those root vegetables!